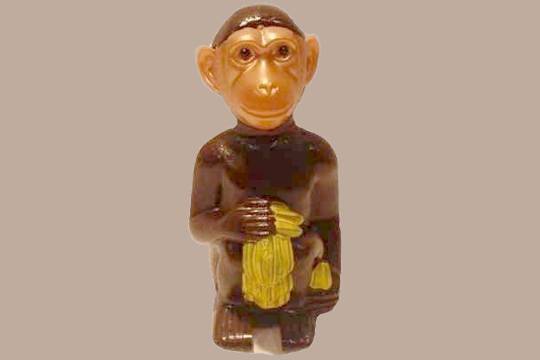 This little chimp will charm you for sure! His little head nods with a slight touch from you - and he'll entertain you for some time. Measuring in at about 5 inches, his height changes as he nods. Hand crafted in southern Germany, our sweet chimp nodder has been created in the same way as the originals that the company made in the 1940s. Each chimp (with his bunch of bananas) has been hand painted, so please allow for the variation that only hand-crafted items offer. Today's kids may think of him as a "bobblehead" but we like the old-fashioned name of nodder. Tuck him in between a few books or add him to the organization on you office desktop and he's sure to bring a smile!